The word of the day was empathizing, which one Muslim camper from Jerusalem, Qais, defined as “feeling somebody else’s pain”. Sarah, who was leading the discussion talked about how when we show empathy, we support the other person. The kids then split into groups, writing down stories about something that had happened to them. Stories were randomly drawn out and read, followed by everybody else finding good language with which to empathize. 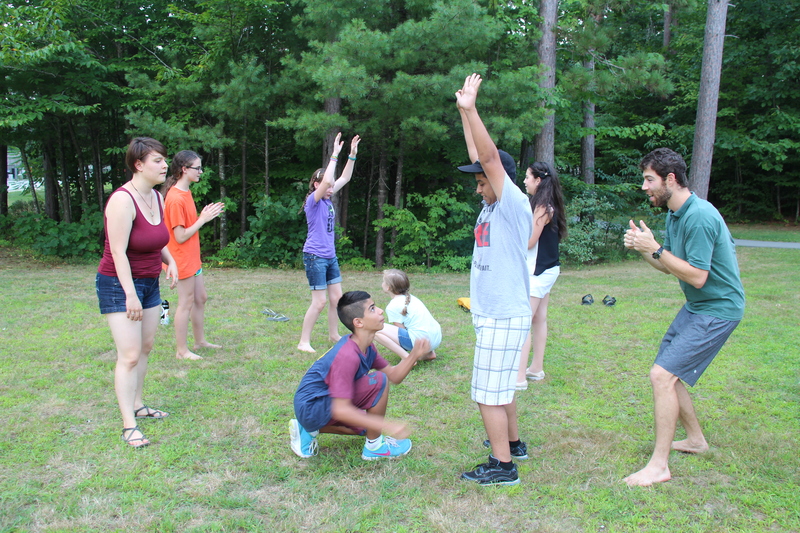 One Jewish camper from the US, Isa, felt moved by one story: “I’m really sorry for whoever that happened to, because that sounds terrible.” After dialogue, Abraham tent groups met to start figuring out their skits for Sunday’s big show! The afternoon was split between swim test and three rotations. Groups either made plaster masks, played sports, or did group games/acro-yoga. For two hours after dinner, preparations were hurriedly made for the upcoming talent show! Cartwheels were practiced, songs were rehearsed, dances were taught and many surprises were devised. The rhythm of camp life is definitely setting in. Parents4Peace: When the kids are away, the parents still play!